A “to-do” list is a powerful way to organize yourself and to reduce stress. Have you ever written one and never achieved what’s on it? Or maybe you’ve written a to-do list but kept putting off the tasks to another day because something ‘more urgent’ cropped up? If either of these sounds familiar, perhaps you need to consider whether you’re writing a to-do list or a “wish-to-do” list. Being realistic with what you put on a “to-do” list is key to being able to achieve it. The sense of achievement at the end of the day is motivating, so you’ll want to do it again the next day! When does the task actually need to be done by, or when are you actually going to do it? Allocate each of your tasks against its deadline on your calendar or scheduler and do this every time a new task needs doing. If a task is too large to be done at one sitting, break it down to the next action and schedule each of these tasks against their relevant deadlines. If you need to get information from people before you can do a part of the task, enter this in your diary too, for a day or two before you need it, so you have room to chase them up, yet still meet your deadline. Get specific! Write the task on your “to do” list in action terms, e.g. “speak to Adam to set up the review meeting” not “arrange client meeting.” This will motivate you to DO the task at the appropriate time rather than worry about HOW to do it. 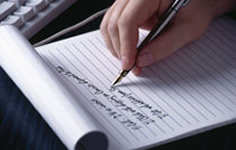 Before you go home at night, print off or write the list of tasks which must be done the next day. Then decide which tasks should be done by you and which ones could be done by someone else, if push comes to shove. It may not be ideal to have someone else do the task, but you will be able to make quick, confident decisions if you find you really are not going to be able to do the task yourself. Be truly realistic about how long each task will take to do, and aim to do each task when you are at your best, so you will do it justice. If you aren’t sure how long things will take, consider doing a time log for a couple of weeks to give you a better idea. Get a running start. If you do several tiny tasks first, you start the Achieve! Achieve! ball rolling. This motivates you to keep crossing things off your list as you work through them. Group similar tasks together. This makes you more efficient as you will be in “telephone call” mode, or “meeting notes” mode, etc. Build in rewards for yourself. Save that nice “treat” task for after you have finished the routine or important task. It gives you something to look forward to and often helps you focus on the task at hand. Turn it into a game with yourself. Set up a points system for each kind of task that you have to do, so that you can see your daily or weekly targets and scores. You could give more points to the tasks you like least, thus building in a motivator to do them! See if you can beat your own high scores. At the end of the day, go home, relax and enjoy yourself, knowing that there are no outstanding worries and feeling great because you achieved today what you set out to achieve. The Institute of Legal Secretaries and PAs has been helping people with their legal secretarial careers since 1990. The Institute was originally founded to promote the excellence and professional recognition of Legal Secretaries and PAs. Our Membership base has grown over the years and we now provide qualifications, support, advice and career guidance to trainee and experienced Legal Secretaries. We have Students and Members throughout the UK and overseas.